Monkey Magic, Shed9C, Forestpines and 1 other person like this. Anyone able to say when the FR operates the Gravity Slate Train? And do they "open" the ride to public, or is it staff only? Gravity trains are run normally for special events and apart from the brakesman it is normally specially invited guests only. Normally the best way of getting on one is to get involved with the team that restores them. Generally they meet at least once a month. 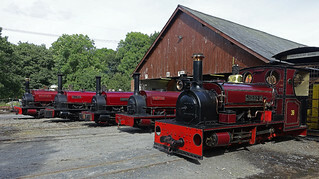 Next runs are scheduled for early September as part of the Heritage Apprenticeship scheme. Superpower will indeed feature Lyn. For most of the action, you are probably best off booking somewhere at the Caernarfon end of the line. If there is something that you really want a go on that departs from Porthmadog, you can always nip on a T2 so you end up back where you started! -tailed" on a vintage set with Taliesin. Don't suppose you know what size train Lyn and Taliesin will be in charge of do you? I was kinda hoping to see Lyn do a solo run too, allow the Baldwin to show what she's really made of, as so far it's true capabilities in terms of how many carriages it can pull hasn't really been tested fully as yet. The shuttles/vintage sets are usually a half dozen or so coaches long. So far as I know the Cearnarfon end trains are always top and tailed. Not sure about the Port-Bedd end. Having said that, the middle of an event with probably minimal slack in the timetable is likely not a good time to conduct haulage trials. After the event, before Lyn returns to the L&B would be a much better opportunity but I am unaware of any current plans. Should be V10, 23 and 24 - traditional looking WHR set. RobT, 45669, Bluenosejohn and 1 other person like this. Two things struck me. The chairs were in nearly as poor a condition as the railway I occasionally volunteer at. It always amazes me that as railways want volunteers to spend a longish day in a signal box smartly dressed and yet cannot give them a basic comfortable chair in good condition which must cost peanuts compared to what is spent on maintaining rolling stock. Possibly fine if you have volunteers coming out of your ears but not if you are trying to encourage more or get them to volunteering on more days. This is the second video I have seen where the fireman on a double fairlie has started firing as the train departs. I would have thought they might have done when the train was stationary or when the train has got moving and the driver notched back as I would have thought firing on starting off when the blast is fiercest would result in the greatest amount of cool air being drawn in to the firebox. This is the second video I have seen where the fireman on a double fairlie has started firing as the train departs. Not sure about this on the FR, but certainly where I volunteer this is fairly common practice - two reasons really - firstly, if you thrown a good round on with a view to the bank you're going hit half a mile away before getting the RA, and then the RA is delayed for five minutes, you end up with the engine sat in the platform blowing its head off, and secondly the making of clouds of smoke in the platform is rather frowned on, and with the coal we burn it's far too easy to create great clouds of unwanted blackness with about two shovel fulls of the stuff, never mind a full round on the grate. The blast when the engine is getting the train rolling isn't usually that vicious either - usually the driver can't open up a huge amount or it just slips - it's once dug in with a bit of momentum when a loco tends to really be working hard. Gravity Train timings for Sunday and Monday for those who are interested. Requested motive power is Palmerston. CLN_WVR, andrewshimmin and Forestpines like this. That's the only road that can be accessed from the Yard. Which station is this? The background to me suggests Rhyd Ddu, but I didn't think the platforms there were curved. Definitely Rhyd Ddu. The platform is on a very slight curve at the Caernarfon end. Thanks - strange how you can visit somewhere so often and not notice something so obvious! Advance apologies for the slightly off-topic question, but I was wondering if anyone could suggest good places to stay if one was aiming to visit both the FR and the WHR? Looking to book a large family holiday sometime next year, and need to work out where would be a good base camp. Is Porthmadog a nice place to stay?